Damian Warzecha posted the ad on Chicago Craigslist two weeks ago. Since then, he's received several offers from potential buyers, but he's refused them because they want to convert the truck into their own concept. "It can't be, say, a coffee truck. 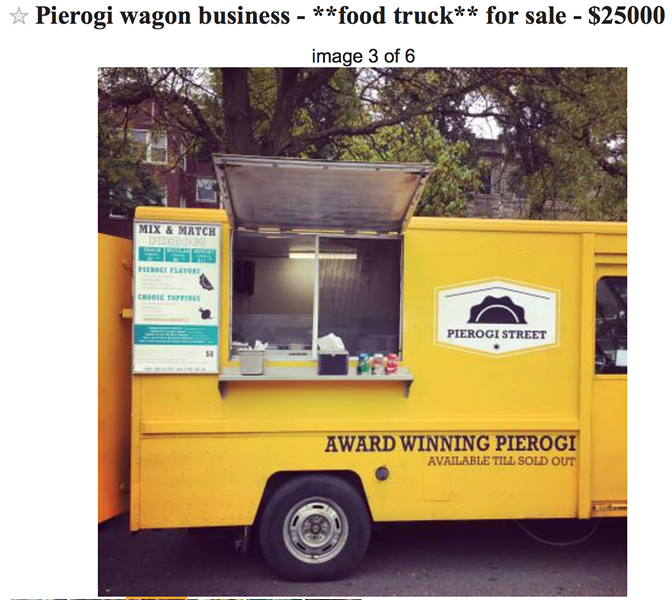 This must remain a Pierogi Wagon," says Warzecha over the phone on Wednesday. "The Pierogi Wagon will not be stopped." Damian told the Reader that he and Jessica are moving to another state after they unload their five-year-old food truck business—though they will still remain co-owners of a Lucy's restaurant in Humboldt Park (1043 N. California) that opened earlier this year and two other food trucks, Lucy's and Flying Taco. In the meantime, Pierogi Wagon (and Lucy's) will still be among the 18 food trucks serving up grub at this weekend's Logan Square Food Truck Social and will continue to cater at events it has been hired for in advance. "We're not closing and running away. We're still here and committed," says Warzecha. "This has been a great concept, and it's worked great for us—we've built a very recognizable brand." So why leave it? Probably for the same reasons others have been exiting the Chicago food truck business over the past five years. In 2012 there were 115 licensed food trucks in Chicago. Last year, that dipped to 70. As documented in Julia Thiel's Reader feature "Why Chicago's once-promising food truck scene stalled out," the local mobile food industry has been a victim of legislative opposition, onerous red tape, costly fines, and the pro-restaurant lobby. Chicago's harsh restrictions that ban food trucks from parking within 200 feet of a bricks-and-mortar restaurant led cupcake food-truck owner Laura Pekarik to file a petition to the Illinois Supreme Court in February, hoping the highest court would overrule the city. "It's been a great ride here, but a food truck business in Chicago. It's not my thing, it's not a friendly business," says Warzecha. "I don't like having to deal with the police—it's so hands-on." Warzecha is willing to be equally hands-on with whoever wants to buy his food truck. For $25,000, the native of Poland will even train you in the pierogi-making arts—even if the buyer is, say, a newspaper reporter. "Do you want to buy Pierogi Wagon?" he asks me at the end of our conversation. "I'm a print journalist, I don't have that much dough," I say. "Let me know if you change your mind."